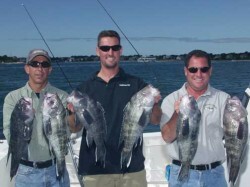 Captains Andy and Rich headed back up to Hyannis, MA in mid-September to get in on some amazing black sea bass fishing. Captain Joe Weinberg of the Fish Hawk of the Helen-H Fleet put the guys on a piece of bottom that was simply loaded with big sea bass. The fish were so thick and aggressive that they put the bait away and switched to diamond jigs and teasers. The bite was non-stop and they caught way too many fish to count. Many of the fish were over 5lbs and some real monsters mixed in. Sea Bass fishing continues to get better and better every year. Anglers are finding juvenile Sea Bass in areas where they have not been seen in 20 years. The future seems very bright for this fish as long as anglers continue to respect the current regulations. If you have questions about any of the sea bass fishing equipment used during the show, please contact us.